Whether you want to reinvent leftover rice or you simply want to make a meal more special, this recipe is guaranteed to get approval from every taster. 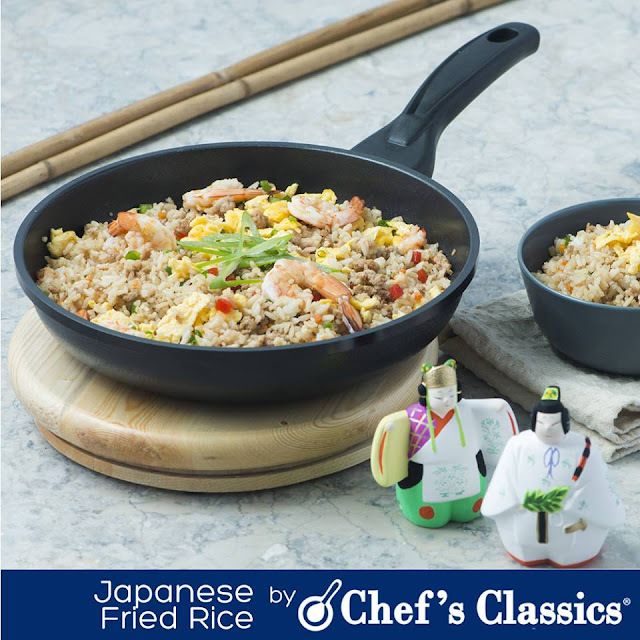 The scrumptious taste of the Japanese fried rice is worth all the effort. You will forgo store-bought fried rice after this fresher and tastier version. 1. In a Chef's Classics Hibiscus frypan, sauté garlic and onions. 2. Add ground pork. Cook until tender. 3. Add chopped scrambled eggs, shrimp, carrots, bell pepper and rice. Mix and cook for three minutes. 4. Add soy sauce, salt and pepper for flavor. Serve.